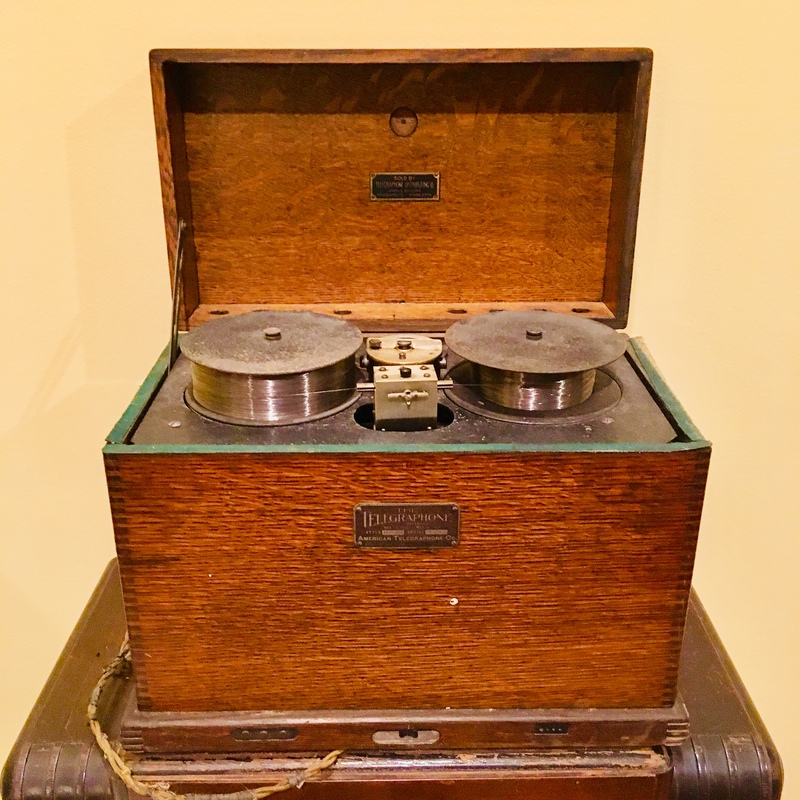 This is a Telegraphone steel wire recorder, the first audio magnetic recording technology, invented in 1898 by Danish-American engineer Valdemar Poulsen. Although obscure today, the Telegraphone magnetic wire recorder preceded the invention of the “magnetic tape recorder” by three decades. With his assistant, Peder O. Pedersen, Poulson later developed other magnetic recorders that recorded on steel wire, tape, or disks. None of these devices had electronic amplification, but the recorded signal was easily strong enough to be heard through a headset or even transmitted on telephone wires. Telegraphones were marketed as recording devices and dictation machines. In the 1920s, Telegraphones were used by the RCA transatlantic telegraph operations center in New York to record incoming high speed Morse code radiotelegraph messages from Europe at 100 WPM, which were then replayed at lower speed to telegraph operators who translated it into text and typed it onto telegram forms to be sent to the recipient. At the 1900 World’s Fair in Paris, Poulsen had the chance to record the voice of Emperor Franz Josef of Austria which is believed to be the oldest surviving magnetic audio recording today. The use of magnetic tape for sound recording later originated in the 1930s in Germany as paper tape with oxide lacquered to it. 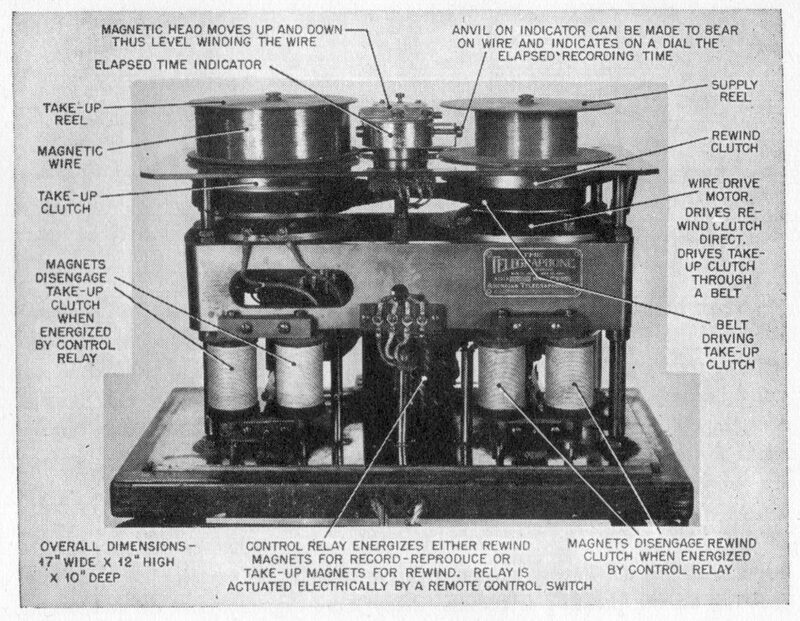 Prior to the development of magnetic tape, the Telegraphone and other magnetic wire recorders had successfully demonstrated the concept of magnetic recording, but they never offered audio quality comparable to the other recording and broadcast standards of the time. Wire recorders had poor audio quality and were replaced by magnetic tape recording in the 1940s. The Telegraphone’s fine steel wire unwinds from one reel, passes though a recording head, and is wound onto the other reel. In the head, the audio signal to be recorded passes through an electromagnet, creating a varying magnetic field. This creates a varying magnetization in the wire which is a record of the instantaneous sound amplitude. To play it back the wire is passed through a playback head where another electromagnet detects the varying magnetization and translates it back to a varying electrical signal, which is amplified and applied to a loudspeaker. Telegraphone, currently on display at the Lovettsville Library, courtesy of the Bob & Christa Bluehdorn and Jonathan Carty Collections. Crossed Wires and Missing Connections: Valdemar Poulsen, The American Telegraphone Company, and the Failure to Commercialize Magnetic Recording, by author(s): Mark Clark and Henry Nielsen. “In the summer of 1898, the Danish telephone technician Valdemar Poulsen invented the Telegraphone, the world’s first functional magnetic recorder. Aided by the Danish businessman S0ren Lemvig Fog, Poulsen set up a research laboratory and a Danish corporation to develop and manufacture machines of his design. The Telegraphone, recipient of a gold medal at the Paris Centennial Exhibition in 1900 and widely hailed as a technological marvel, seemed destined for success. Over the next twenty years, Poulsen and his partners sought to capitalize on his invention, forming partnerships with firms in Germany and the United States. 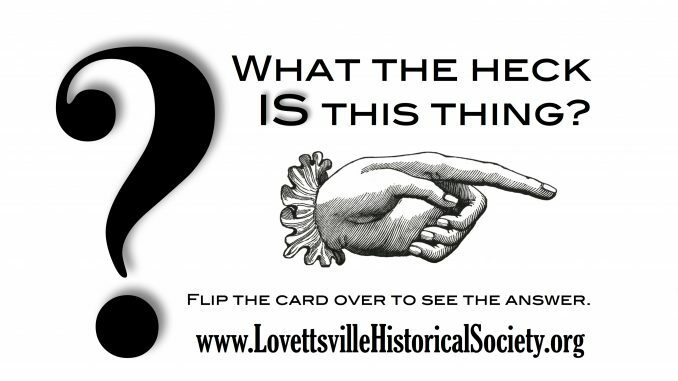 Visit the Lovettsville Museum and see more of our What the Heck mystery objects. We are located next to Lovettsville Town Hall at 4 East Pennsylvania Avenue. Open Saturdays 1:00-4:00. The Lovettsville Historical Society is a nonprofit organization that relies entirely on volunteer help. Support our mission to preserve and protect the history of Lovettsville, The German Settlement, and our unique corner of Loudoun County, Virginia. Purchase a membership or make a tax-deductible* donation today.